1- Brits do not have to abide by rules and regulations of EU, which has its Pluses and its Negatives for Brits. 2- Brits will have about 400 Billion Pounds that they are paying into EU Social funds to go into UK Social Funds, in particular the Government run Universal Socialized Healthcare (NHS), is the main reason why many (older) Brits voted for this Brexit. 1- EU will be able to grow and get stronger under the natural leadership of Germany & France, without interference by UK that does not want to see EU get stronger and stronger, which by the UK (and US Israel) strategic thinking means them getting weaker. 2- EU having its own EU Force and phase out NATO and US Troops. And that is why typical European Citizen, are very glad to see UK out of EU. But overall in fact this Brexit may have little effect, since after all UK remains in the same place as it was before, that is Anchored to Europe, which is about 50-Miles from main land of Europe and a major trading partner of Europe. Which facts you can see by Euro having lost little, if any value, vs US Dollar after this greatest hit against EU (Euro) supposedly, with the biggest currency looser in fact being the British Pound Sterling. 1- Government run Universal Socialized Healthcare (NHS). So their people get Healthcare FREE for Taxes they pay, while they spend 50% LESS, repeat they spend 50% LESS and not More, on Healthcare compared to USA that has for profit Wall Street based Healthcare. As a result of which 100-Million Americans either have NO Health insurance at all, or what Health insurance they have is a license to bankrupt them since typical Healthcare that you get from these Wall Street based Health insurance policies, whether before or after the JOKE called ObamaCare, come with exorbitant $700 per Person monthly premium, plus $10,000 per Year per person Deductibles, plus 20% Co-pay, etc. Wall Street rip-offs. 2- Strict Gun Laws, as a result of which UK has 0.1% of Gun related Killings that USA has. As a result of which UK has had 1 Mass Shooting in the last 10 years while USA has had 100+ Mass Shootings over the same time. And as a result of which real Democracy they have in UK, lunatic Republicans like Trump would not get 10 Votes and frauds like Obama Clinton Democrats would maybe have 2 seats in the House. where is similar referendum Vote in USA for US Troops to leave Europe Union (NATO)? "We have a Spending problem"
1- People in UK, via their Vote, 100% support their Government run Universal Socialized Healthcare (NHS). And that is why even Margaret Thatcher's and James Cameron's Conservative party in UK are 100% for their NHS. While in USA Republicans such as Trump call NHS to be: "Socialism" & "Communism"
And Obama/Clinton Democrats say that "we cannot afford Single Payer NHS" as they have in UK, when Single Payer NHS that they have in UK costs 50% LESS, repeat costs 50% LESS and not More, than the for profit Wall Street based Healthcare we have in USA. "Police State" or "Hitler also collected all the Guns"
So this Vote for Brexit is Vote for even more Socialized services in UK, what Republicans and right-wing Media in US call "Socialism" & "Communism", yet by some Osmosis Republicans and right-wing Media have interpreted this Vote as a Vote for their ideas, a Vote against "Socialism" & "Liberal ideas", when this Vote is 100% for more Socialized services. So this Vote in UK is a reminder that were USA to be a Real Democracy where the Vote of People actually matters as it does in UK, then Republican such as Trump would be DESTROYED by the Vote of the People, that ZERO member of Senate or House would be Republicans, given the FACT that Republicans call the NHS which British People cherish, to be: "Socialism" & "Communism". And Obama/Clinton Democrats would be on their last legs too, with maybe Sanders alone remaining. 1- UK has had Government run Universal Socialized Healthcare (NHS) for Decades, so that their people get Healthcare FREE for Taxes they pay. In contrast to USA where 50-Mill+ have NO Healthcare, 2-Million+ go Bankrupt per Year due to Healthcare costs, etc. 2- UK has enacted Stricter and Stricter Gun Laws, as a result of which UK has 0.01% of the Death due to Guns that USA has. "And we’re talking about months, not years, for this to play out." But NOW they have gone back and Edited that prediction and that Title from that Article! Euro far from Collapsing will continue to be More Valuable than US Dollars, and in fact US Dollar will NEVER EVER even reach parity with Euro, which is where Euro was introduced in 2001. Because US lacks necessary Socialized services that other Developed Nations, such as UK, have, and adds to that horrendous problem by wasting American People's Lives and Money on a Gargantuan Military and resulting War after War after War. UK and EU far from doom & gloom prediction of Alan Greenspan, etc. will continue to be KING to US Dollar and quality of life. Which facts you can see by just watching the EU 2016 which will resume tomorrow in France, where stadiums will be PACKED to the Rim with Happy People spending merrily across the European Union, because they have Real Democracies, where their People control their Governments via their Vote, unlike USA where a right-wing Cabal controls the Government. All of which facts you can see proven by Euro remaining nicely more valuable than US Dollar. 2- NHS in England means free Healthcare for Taxes People Pay, at the point of use, for all UK residents. 4- How does UK style Single Payer Universal Socialized Healthcare give Healthcare to all while cut health care spending by about 50%? 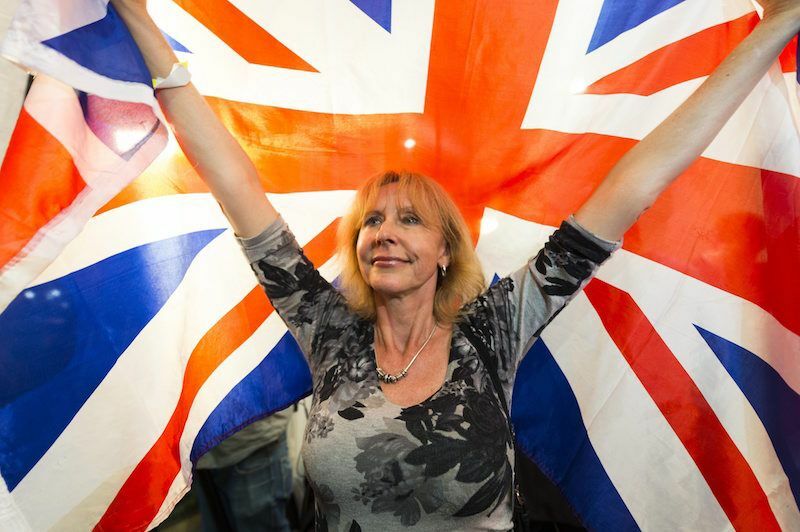 Odd...there is little celebration or jubilation in the streets of the UK. In fact it seems from reading the British news sites it's more of an omg reaction...what did we do? The Reality is the "Brexit" vote while surprising to some, other than creating temporary market volatility due to the surprise vote, has no other real effects on the world. Nothing Real changes by it. England doesnt even use the Euro currency AND all future trade deals with the Continent (Europe) will now take 2 years to re-negotiate terms. Nothing real changed. Yes, excellent reality check. I agree. Well the Pound maybe back to its pre Brexit level by then. Britain leaving the EU does not have to be a bad thing. To see this fact just chck out Switzerland, that is operating in a "single" market and outside of the EU so can Britain. And is one of the Richest Countries in the World. Otherwise, I agree with you that "Brexit is a victory of ordinary people. One that I actually have made but not in as succinct a way as you have. So yes, overall this Vote beside demonstrating the Real Democracy that UK is should have a Net positive effect for UK Middle Class.